Or did you mix up the names? 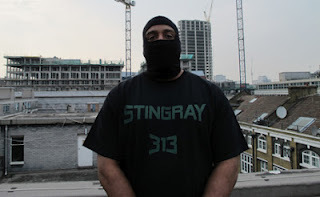 It's hard to tell from the interview but I think Stingray did produce it or co-produce with Stinson, originally for a Drexciya project, and then Stinson slowed it down and it came out as a b-side on the 12". It's funny how his agency promotes him... I always thought his shows were misplaced. I would have put him in a gallery where entertainment would be secondary to the performance. The way I see it his audio landscapes and visual decor go much further than ordinary electronic music and do not really belong in a club wherever. I also believe he himself looks at his work more as an art piece praising the machine than a simple mean to entertain. I wish I had the cash to organize this. So tired of all the musicians going to California. This would never happen if Doppler was in Chicago. Thanks for your answer @stephen. No he says the track was leftover from the Urban Tribe LP from 1998 'The Collapse of Modern Culture'. James liked it and slowed it down.